One month. Two speedrunners. 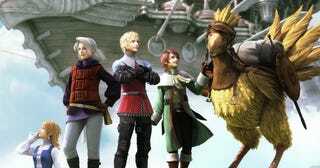 21 Final Fantasy games. I've been following this race since yesterday, and there's something kind of amazing about watching people marathon these games. The rules: no skipping cut-scenes; yes taking sleep breaks; whoever finishes everything first wins. If you're curious, you can check back here throughout the month to see how they're doing. (Or use this link for a side-by-side view.) They've also got Patreons set up in case you want to donate and convince them to take on ridiculous incentives. Here's Crumps2 and here's Cereth.